The latest Harry Potter movie has opened to critical acclaim and to box office records. 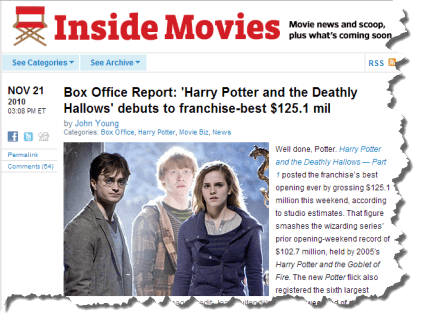 Millions of people will be watching “Harry Potter and the Deathly Hallows: Part 1” over the coming week – indeed in the UK it has already taken over £12m in its first two days and looks set to smash the takings of any other British movie’s opening weekend. And whatever you think of the movie or of J.K.Rowling who came up with the Harry Potter stories, you must agree they are just that – great stories. Indeed, the Harry Potter books are full of the traditional ingredients of great stories – solid characters, great settings, conflict, intrigue and nail-biting tension. In short, the Harry Potter books and movies are excellent examples of good, old fashioned narrative. Research has consistently shown that narrative – an engaging story – is one of the key components of persuasion. However, when you are trying to sell something, people resist your story telling. They know that you are trying to get them to buy something, so your persuasive powers have to be considerable. Added to that, most sales engagements are short-lived, which means if you do have a story you have little time in which to get it over. However, new research from the University of Saskatchewan in Canada has shown that narrative is rather fundamental if you want to get your message across and get people to buy from you. Although the study looked solely at the fashion industry, what it discovered is important to any sector. The researchers found that when narrative was made possible – largely with unusual imagery – people did “get” a story even when none specifically existed. In other words, they merely perceived a story, which allowed them to become more engaged and connected with the advertising. It is another study confirming that story is immensely powerful. It also implies that if you do not have the time to tell a story if you suggest one, your readers, listeners or viewers “get” one. They appear to perceive a story providing you give them the right signals – in the case of this research, unusual photography. So, on your website you can use a similar technique. Images, graphics and headlines that imply narrative will allow people to perceive a story as existing, making it more likely you can persuade. For instance, if you have an e-commerce site and you are selling tents, photos of tents on their own in your online catalogue will be less persuasive than tents with a family sitting outside, implying the story of a family holiday. Equally, in your text if you suggest stories with appropriate words in headlines, your web pages will become more persuasive. Story telling is hugely powerful and far too infrequently used online in business websites. Maybe that’s because people putting the sites together think they don’t have the story-telling ability of someone like J.K.Rowling. But as this new research suggests you don’t have to tell complete stories – just imply them. In fact, rather like Harry Potter movies you could use a lot of “smoke and mirrors”…!